Looking back at my travel posts thus far (one suitcase series and how to pack for work travel) they give a lot of inspiration and information but they don’t quite have the easy, no brainer now how do I actually do this myself type help. So I thought it might be useful going forward to summarize, item by item in checklist form (and I looooovvve checklists so this makes me really happy), what I actually pack. That way it’d be easy just to follow the list to confirm you’re on the right track (maybe not ‘right’ but at least what works for me) when you try to pack yourself. And of course a checklist will answer the very important question that I get after every. single. 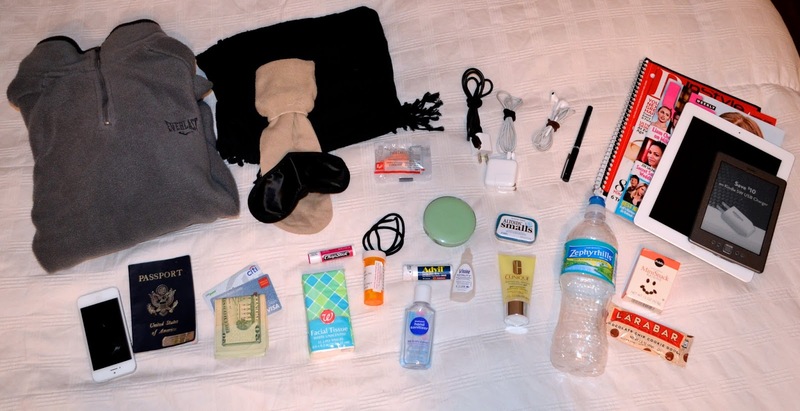 One Suitcase post… Do you pack UNDERWEAR?? I don’t see them in the picture!! OMG where are your BRAS!!? To start off my first checklist type post, I think I’ll do a shorter list to help me get the format right. I’ve had quite a few questions around what I bring in my carry-on tote for a long flight. (I’ll do another post with end-to-end list of what’s in my suitcase.) 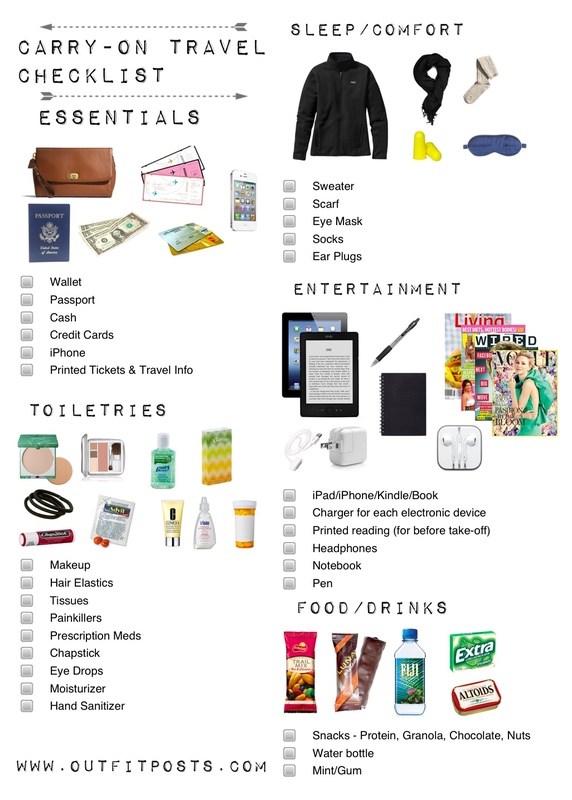 This is the list of things that I pack to use while on the plane. Below is what I bring that works for me – of course you may need more or less. 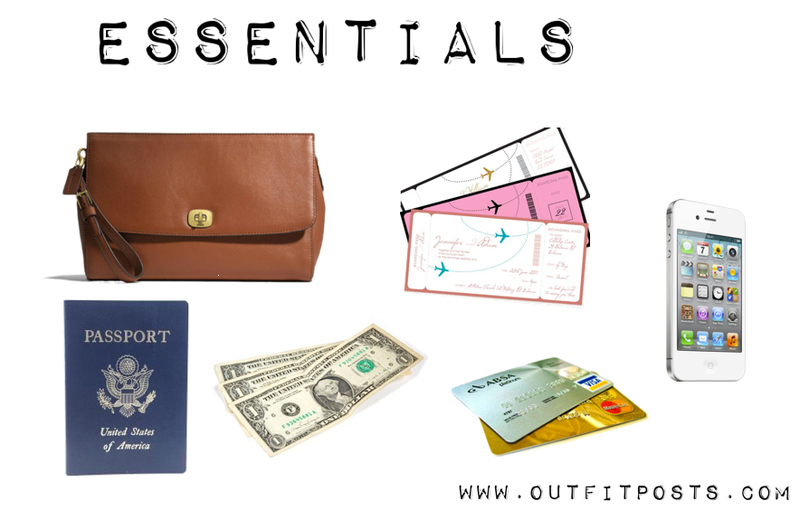 ESSENTIALS – This group of items are the absolute essential things to bring list. Without this stuff the trip isn’t happening. If you forget items from the rest of the list you can just buy another version in transit or at your destination. Wallet/Wristlet – I like to bring a wallet that does double duty. It holds all the essential items in my carry-on tote but can also be used as a small stand alone purse once I arrive at my destination. A slightly bigger wristlet is also easier to find in the bag then a small wallet. Passport/ID – Necessary. Also it’s good to leave scans/copies of these with loved ones at home in case of loss/theft. Cash – I don’t bring too much cash but it’s nice to have some in case you come across a cash only vendor. Small restaurants, street food and taxis seem to be the places I used cash the most. Credit/Debit Cards – They way I pay for most things while traveling. Good idea to call them before you leave to let them know you’ll be traveling. Otherwise the fraud department will freeze the account thinking it’s unauthorized activity. iPhone/smart Phone – I use my iPhone for everything. I store my tickets/reservation info. I use as a translator in countries I don’t speak the language. It’s my map. It’s my currency converter. It’s my camera. I typically turn on the international data plan before I leave the country. That was I can use all the online functions while I’m traveling. (I clear the data usage count in settings before I go so I can track my usage to make sure I don’t go over the international data allotment.) And I use Skype to call home instead of paying international minutes. Tickets/Hotel Reservations – I usually keep these (flight & hotel info) on my phone in an email/doc that I can get to without internet connection. But in case of phone battery running out – it can be nice to bring the printed version as well. SLEEP/COMFORT – Sleeping on overnight/long flights isn’t the easiest thing to do. Noise, temperature and being stuck upright all make it difficult to get shut eye. 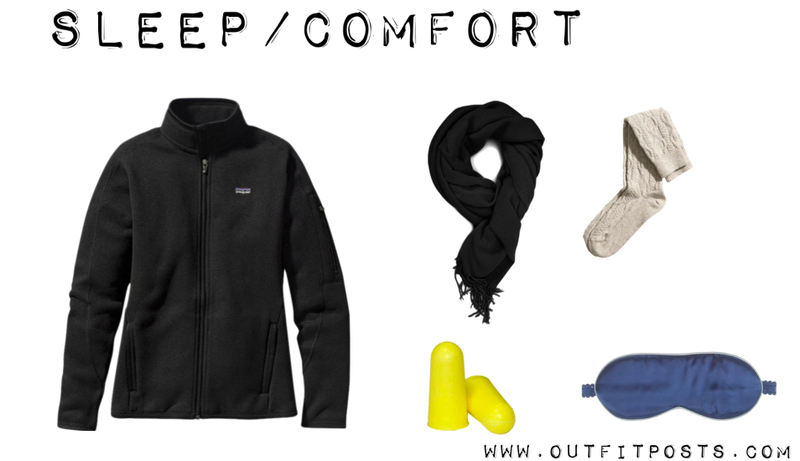 But I find the following items help as much as can be helped to get me comfortable as possible. Sweater – I’m cold on every plane. Sweater is a must. I bring one even when I’m traveling somewhere tropical. I usually like to bring a warm fleece type jacket because those are so cozy – unless I’m headed somewhere really cold – in which case it’s my winter coat. Bunched up it makes a good pillow too. (I personally don’t use those u-shaped neck pillows – some people love them – but they don’t really work great for me.) It’s typically a dark color so that if it gets dirty it doesn’t show and also black/grey seems to blend in better in other countries. Scarf – Again, I get cold on planes so scarves are wonderful around your neck. Scarves are great on trips in general. They double as blankets. Wadded up as pillows. 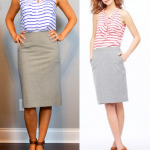 If they’re colored – they can change the look of outfits. I typically bring a black one for my tote to use plane and another colored/patterned one in my carry-on suitcase for the trip. Socks – Nice to keep those feet warm. Air drafts are often blowing under the seat – even while wearing flats my toes get cold. So a cozy pair of socks are great. Ear Plugs – These are great when there are loud talkers or crying babies nearby. ENTERTAINMENT – Long flights mean lots of time to kill when not sleeping. Also delays and getting stuck in airports for hours on end isn’t uncommon. Nice to have something to keep you occupied while you wait. 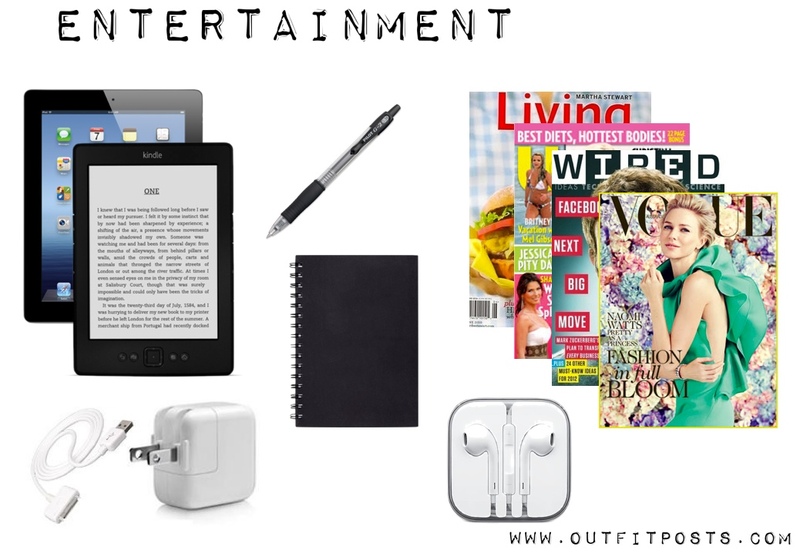 iPad/Kindle/Book – I love to be in the middle of a good book while I travel. I’m a huge reader and dropping into the book world lets me forget delays, annoying people and lines. I use my kindle all the time because it’s so much lighter then lugging around a few big paperbacks. I also suggest whatever digital entertainment suits your fancy. I like to download movies/tv shows on my iPad. Chargers – Chargers for whatever devices you decide to bring. Don’t want those electronics dying on you. My recent international flights had USB plugs in every seat. That was awesome. Otherwise I usually find myself huddled around those charging stations at airport gates to grab some juice on the go. Notebook – There is something about having some time to myself that lends to writing down lists. I prefer to have a notebook to do this instead of on a digital device. Pen – For the notebook but also for custom forms in flight. Print reading – Nice to have a magazine or book that you can read during the ‘no electronics allowed’ times for take off and landing. 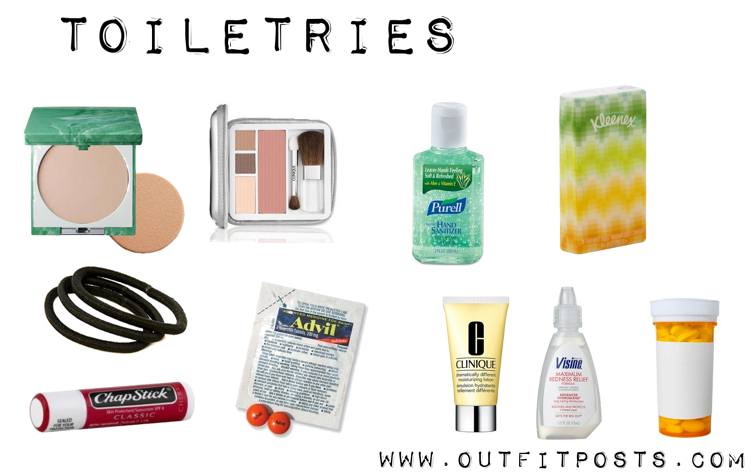 TOILETRIES – This is my list of toiletries that I find make my flight most comfortable. You may need more or less. Make-up – When I wake up on a red eye flight I personally like to have powder, under-eye concealer and maybe a little multifunctional compact with eyeshadow & blush to make me look a little less greasy zombie. I’m a long time clinique powder fan. Eye Drops – My eyeballs get dry when I fly. Love to have eyedrops on hand. Moisturizer – Skin gets dry when I fly. Moisturizer is great to have. Hair Elastics – After hours and hours of travel, there’s pretty much no question my hair is in a ponytail. Some hair elastics on amazon. Chapstick – My lips get dry when I fly. Chapstick is great. 24 pack on Amazon if you need a lot of Chapstick. Hand Sanitizer – Confined space. Lot’s of people. Sanitizer is great. Pack of travel sized Purell. Tissue – I don’t always use these but they are great to have when you do need them. Sometimes I find myself allergic to person next to me perfume or if something spills in my liquid bag. 10 pack of travel tissue packs. Prescriptions – Don’t forget to carry any important prescriptions on you. Pain Killers – It’s the worst if you get a headache and don’t have these. Great to have when they are needed. 3 pack travel advil tubes. FOOD/DRINKS – For long flights it’s nice to not be at the mercy of the beverage/meal service of the airlines. If it’s not a super long flight you have to pay like $9 for a little snack box. Bottle of Water/Reusable Bottle – Sometimes I buy water once I’m through security. Other times I’m more responsible and bring a resuable sports bottle and fill it up at the water fountain. Either way it’s great to have a drink with you and not have to wait on the tiny cup beverage service. I have this bottle in blue. I love how the straw seals into the top. Great for not dripping all over your bag. Gum/Mints – Great for gross breath and sitting close to people. Snacks – I usually like to bring some kind of non-perishable, non-squishable food in my bag in case I get really hungry. 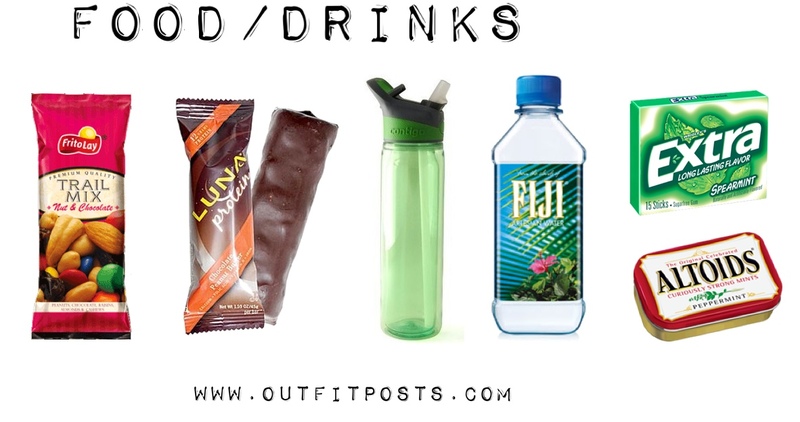 Things like protein bars, nuts mixes, chocolate or granola bars. TRAVEL BAGS – Now you’ve got all of your stuff laid out you need to be able to easily carry it, find it and access it while traveling. 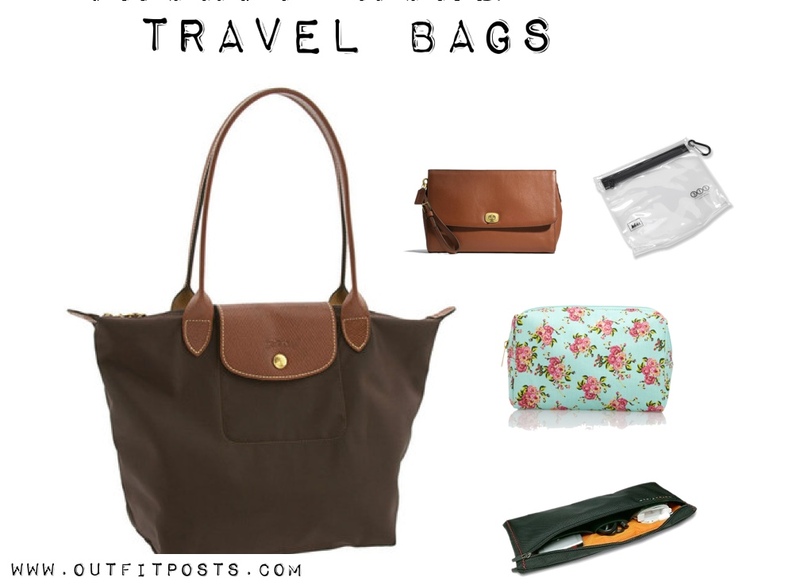 Here is a list of bags that I use in my carry-on tote. (For my full suitcase packing – I have a few more.) 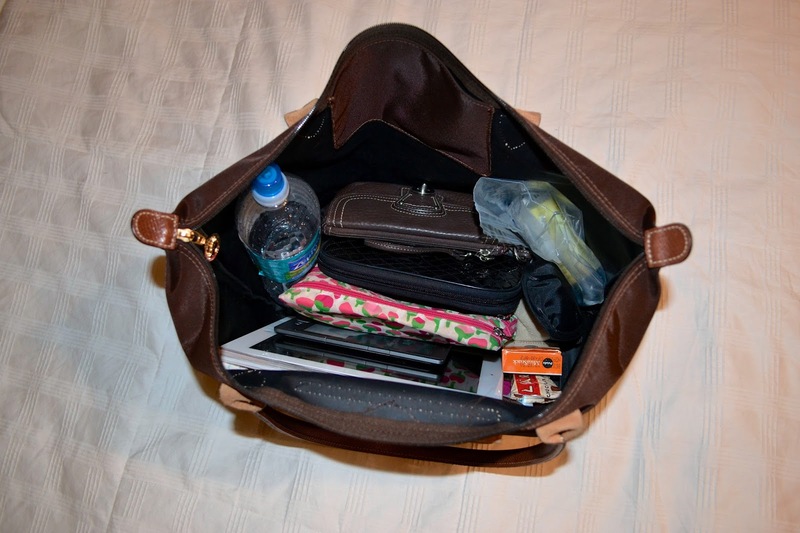 Other then the tote itself and the wallet – ziplock bags work pretty great for organizing liquids, makeup and cords. So while I happen to have bags for the other stuff – a few plastic baggies will get you pretty far. Tote – I bought a Longchamp tote bag on my first trip to Paris in 2006. It has held up remarkably well through a lot of abuse as my travel bag and sometime beach bag or gym bag. It’s super helpful that it folds up really small – so sometimes you can just stick it in your suitcase in case you need another bag on the trip. Wallet/Wristlet – All the essential things go in here. Plus usually the pen so I can find it. Liquid Bag – 1 quart sized bag for liquids. From the list above – the moisturizer, eye-drops and and hand sanitizer would have to go in here. For a studier option the a normal ziplock you can buy TSA approved bags with reusable bottles. Make-up Bag – I keep/collect all those bags they give you when you get free gifts at make-up counters. I always use one of those for my makeup. There are one million options for makeup travel bags. If I were buying a new one – I would play with the in person somewhere like Target to see if it has zippers & pockets that would suit my needs. Electronics cord bag – This is often just a ziplock for me. But great to have your cords separated out from the rest of your stuff so they don’t tangle up and prevent you from getting stuff out of your bag. Again, there are a million options for travel cord/electronics organizers. I usually just use a big sized ziplock. 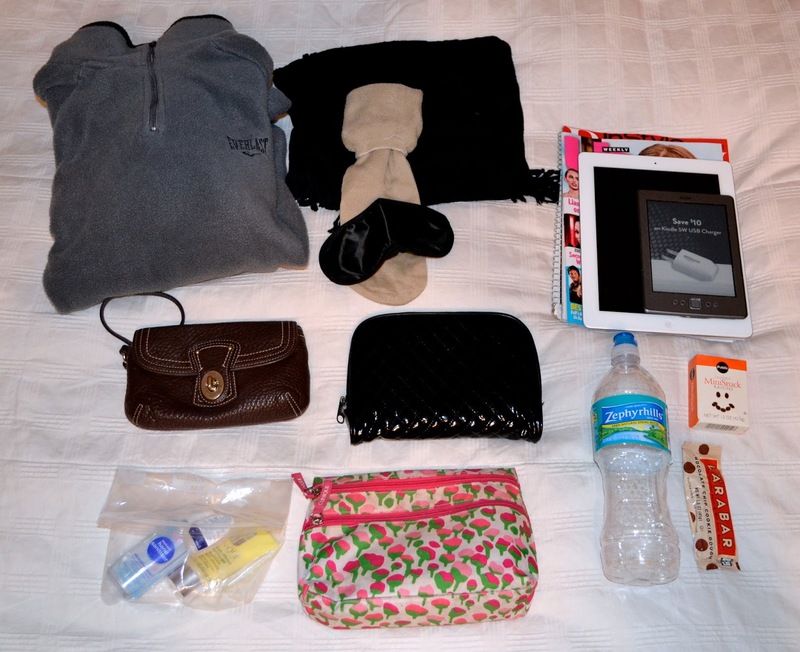 Here’s an image with everything pointing to the bag it blogs in. And click here or the graphic below to access a printable list of all the info in this post. And here is my stuff freshly unpacked from my trip to Argentina and about to be repacked to head to Paris. My stuff all laid out. Smaller bags into the tote. Sweater, scarf and tote ready to go! This post is AMAZING! The most organized, clear, easy to follow and informative travel post I've EVER seen. And I've been researching travel tips for weeks! Your blog is so inspirational to me!!! Thank you! I like this post a lot! Last year my husband and I started to travel with only carry-ons. We went to Alaska and Seattle for 11 days and we recently went to Ireland for 10 days… and we only brought carry-ons. 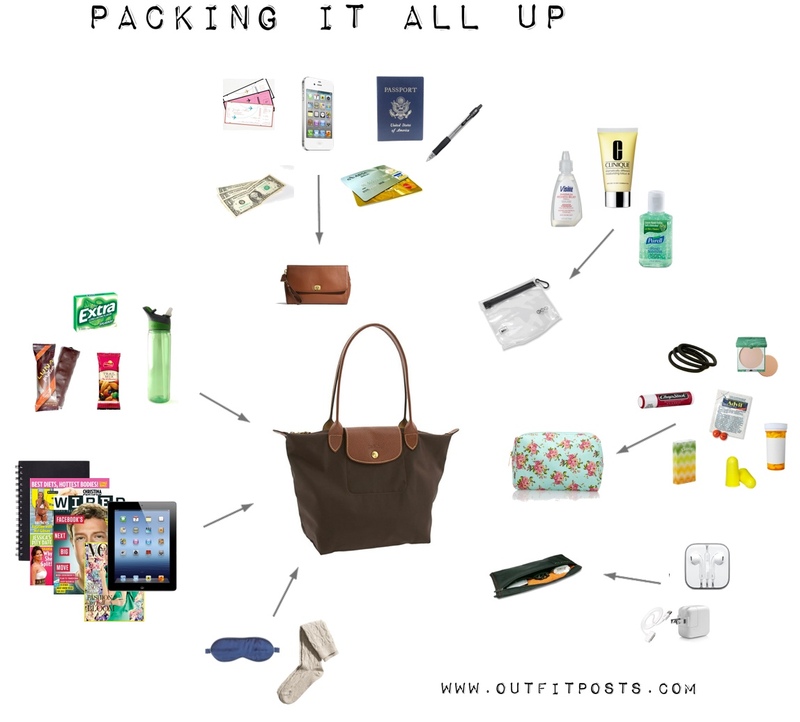 I find I get very excited about that process… because I used to be an overpacker. Your blog and your one suitcase series actually helped me learn how to maximize my wardrobe while on vacation without bringing a million items. Thanks for this Amazing List & allowing us to print also. This helps so much! Thank you thank you thank you. Also, thank you too, I am always seeming to lose things in my Longchamp when I travel. Your organization tips really made my morning! W.O.W!! thank you! I usually keep the same stuff as you in my tote. BUT you gave me a fantastic idea of segregating stuff into smaller bags. I esp tend to mix up my makeup and other essentials!!!! Thanks again for your brilliant ideas. Love this!! I am a HUGE list girl! The only thing I would add is a camera. Usually a long plane ride (for me anyways) means somewhere awesome where I want to take lots of pics. Unfortunately I bring my big mamma jamma DSLR and she has to ride with me on the plane. Makes my carry on heavy and limits space. When I went to Paris I ended up only using one lens even though I took two so I think when I travel again, I'll save space and only take the one lens. Thanks so much for taking the time to create this and for sharing it with all of us! LOve this post. I will definitely be printing it out. It's always nice to have a check list of what to pack. Makes things so much easier. I'm with you on the cold. I'd love to see your travel outfit. I have to wear a long sleeved sweater and I have to wear cute shoes that require socks because my feet just get too cold like yours! This list is wonderful! Thank you so much! Wow. Thanks for the list. Where does your laptop go? My comapny requires that I carry my laptop with me at all times. Is it in a separate bag? C. Wonder also has a nylon tote (HERE) and I have actually been debating between splurging on the Longchamps or trying out the C. Wonder one. That's fantastic! Glad you find the blog helpful. I hope your trips were amazing!! DSLR pictures would have been amazing in Paris. But I just brought my iPhone and did the best I could with that. 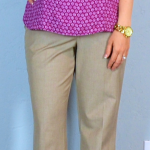 My one suitcase paris posts series just started today and tomorrow's outfit #1 is what I wore on the plane on my overnight flight for my trip to Paris. Hope that helps! I've never tried any C.Wonder products so I have zero idea of how well they old up. My Longchamp tote is almost 10 years old – so I think it's held up pretty well. But Longchamp definitely is pricey! Thank you! Yes it's the large. I also have several small bags from cosmetics stores, I've won some in Sally Beauty Supply when I buy more than 400 Mexican Pesos (around 30 USD) and this is the time they get useful. On April 2015 I'm leaving to Japan for 1 year, to study Japanese and bought a ScanSmart BackPack whick will be an excellent carry-on. I was looking for a simple list of items to take on a weekend trip and I found this. Thank you very much.